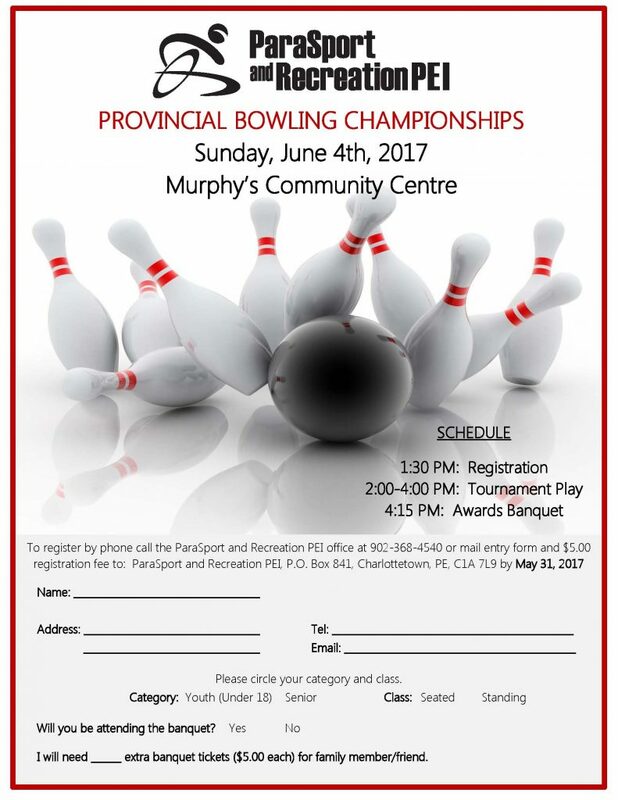 ParaSport and Recreation PEI’s Annual Bowling Championships for people with a disability are scheduled for Sunday, June 4, 2017at the Murphy’s Community Centre in Charlottetown. This is a fun and social event, absolutely no bowling experience is necessary. The tournament classes are the following: Youth (under 18 years of age) and Senior- Male & Female (18 years of age & over) in seated and standing classes. Awards will be given out to the top three bowlers (highest total pin fall) in each age group and class (Youth & Senior and Seated & Standing). Following the tournament, participants are invited to stay for the Social/Awards Presentation where we will celebrate our top bowlers and enjoy some yummy food. To register, please complete the form (below) and return it to the ParaSport and Recreation PEI office. The registration deadline is Wednesday, May 31, 2017.